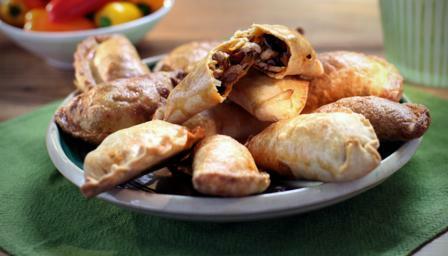 Traditional in Spain and Portugal, empanadas are little pastry pockets with an intensely flavoured savoury filling. They are great eaten any time but make a particularly good tapas-style snack with a cold beer. For the filling, put the chicken thighs in a small roasting dish, season well all over with salt and pepper and roast for about 45 minutes, or until cooked through. Set aside to cool a little. Meanwhile, make the pastry. Melt the butter and leave it to cool slightly. Put the flour in a large bowl and mix in the salt. Pour in the butter and egg. Start mixing, adding 3-5 tablespoons of water as you go, until you have a soft dough. Turn this out onto a clean work surface and knead it gently for a couple of minutes, or until smooth. Return the dough to its bowl, cover and set aside to rest while you prepare the filling. To finish the filling, heat the oil in a frying pan over a medium-low heat. Add the onion and cook for 10–12 minutes, or until soft. Add the garlic, chorizo, cumin seeds and raisins. Cook over a medium heat for 5–8 minutes, stirring often, until the chorizo is cooked. Remove from the heat. Once the chicken thighs are cool enough to handle, remove the skin. Pull all the meat from the bones and chop it roughly. Add to the chorizo mixture. Taste and add salt and pepper if needed (the chorizo is already quite salty), then leave to cool completely. Turn the oven to 200C/400F/Gas 6 and line a large baking tray with baking parchment. Lightly flour the work surface and roll out the dough to a thickness of 3-4mm. Use a 12cm/4½in cutter or a small bowl to cut out 10 discs. You will probably need to re-roll the offcuts once to get this many. Divide the filling between the discs. Dampen the edges of the dough with water then fold over one half of each disc to make a semicircular parcel. Press the edges together firmly then crimp or press the edges with a fork. Put the empanadas on the baking tray and brush with beaten egg. Bake for 15–20 minutes, or until golden-brown. Eat them warm, on their own or with a chilli sauce.